I was on the same bridge looking down on the same strip of Sukhumvit Road as yesterday. Things were different, though. The Red Shirts had seemingly moved past their street festival. They’d moved on from their pop concert. They were now cruising the streets in frat boy spring break mode. 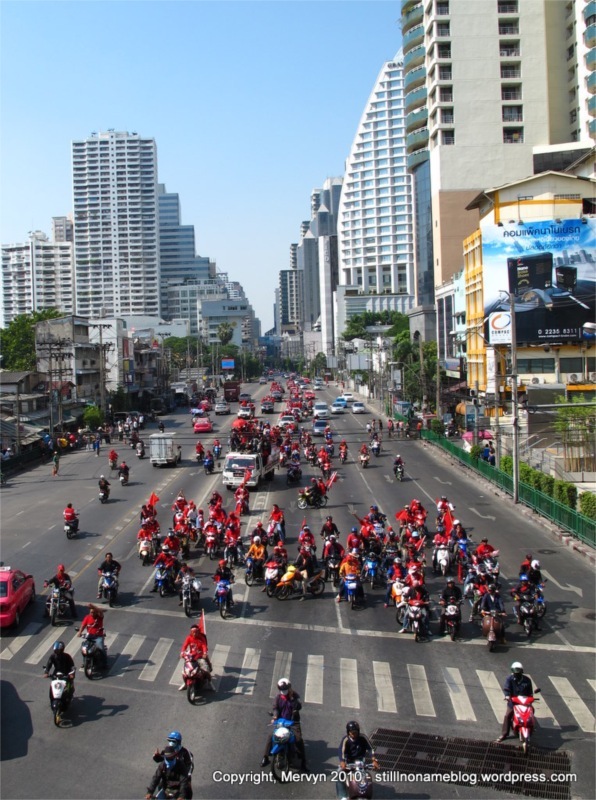 The Red Shirts were on motorbikes, pickups, cars, taxis, and tuk tuks. Music blared from giant onboard speakers. People were using giant megaphones mounted to their vehicles to urge the crowds to do … something. Just an hour earlier, I’d reached Emporium after walking the same route I’d used the day before. I was visiting travel agencies, looking for a cheap way to get from Bangkok to Siem Riep, Cambodia for the next leg of my journey. The walk had been, like yesterday, hot and uneventful. 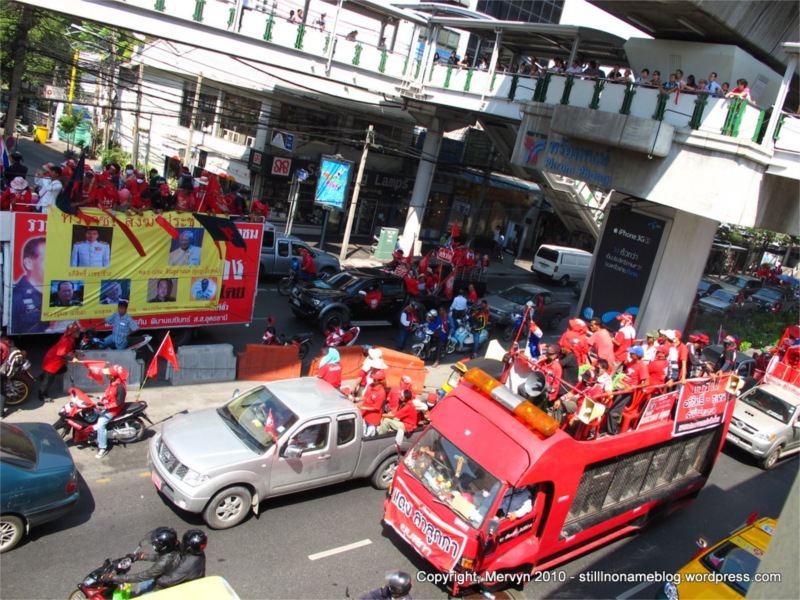 There’d been a couple Red Shirts at an intersection, smiling and waving flags at about 15 policemen who were behind yellow metal barriers guarding a local soi. I didn’t even pay it any mind. Coming out of Emporium, though, was a different story. People were stopped on the pedestrian footbridge gawking at a Red Shirt parade. The onlookers had their camera phones out, snapping pictures. The Reds had commandeered all but one lane of traffic and were headed … somewhere. 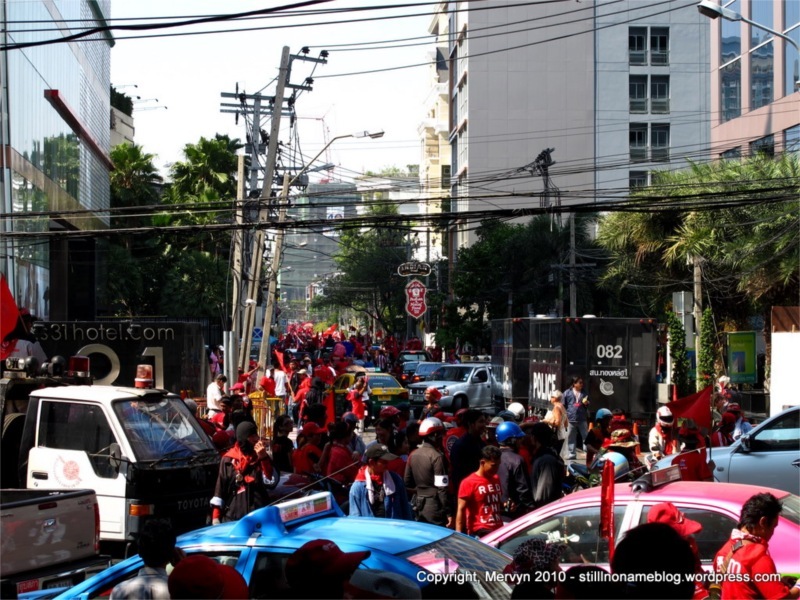 #1 – It’s the same intersection I’d been at earlier in the day where the police were standing behind metal barriers, chatting and smiling at the demonstrating Reds. #2 – I know that a lot of government officials, including the PM, live in this area of Sukhumvit. In fact, I’d passed one on the way to meeting Franck and Becca for lunch a few weeks back. Soldiers had made me walk on the other side of the road. 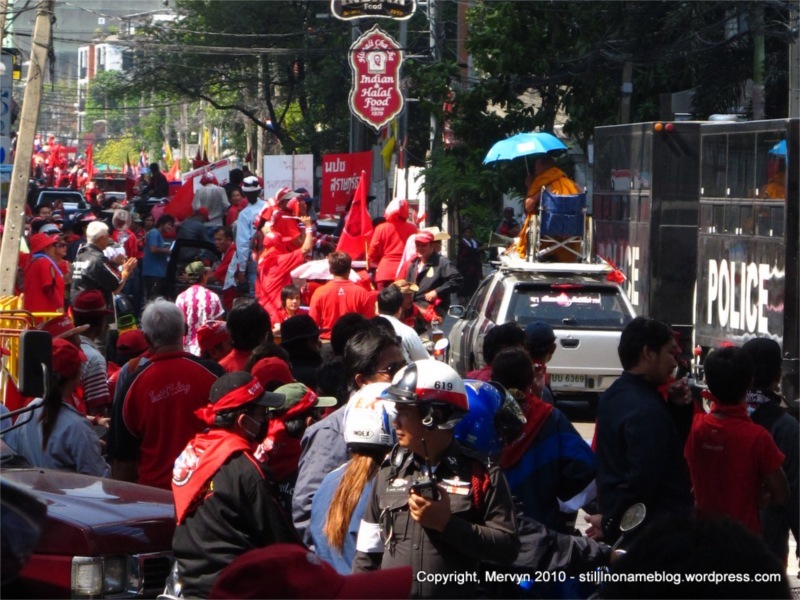 #3 – I heard on the news later that the Reds had marched to the PM’s house in Sukhumvit. I walked Sukhumvit from Phrom Phong to Nana (i.e. the area of Sukhumvit closest to the Prime Minister’s house). The intersection I saw was the only one with any action. I’d bet money it was his place. Regardless, there was a lot of activity. 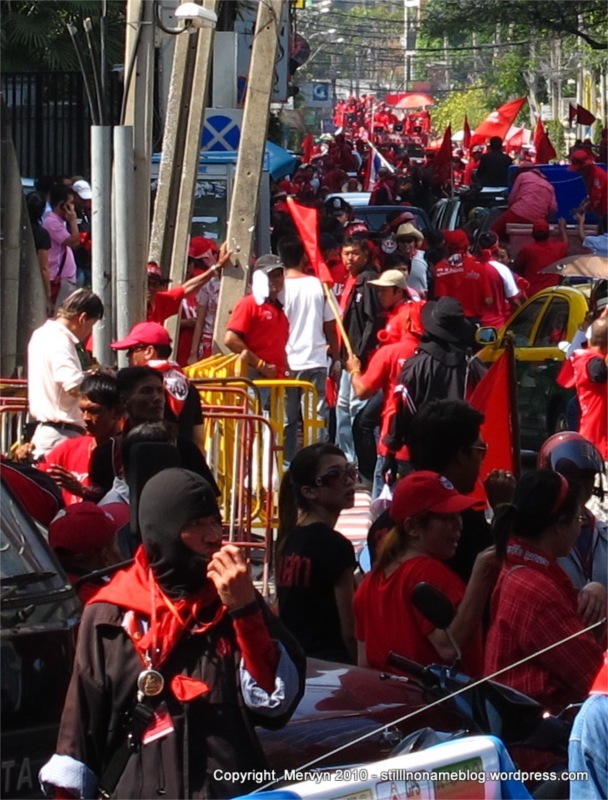 Red Shirts dressed in black directed traffic. 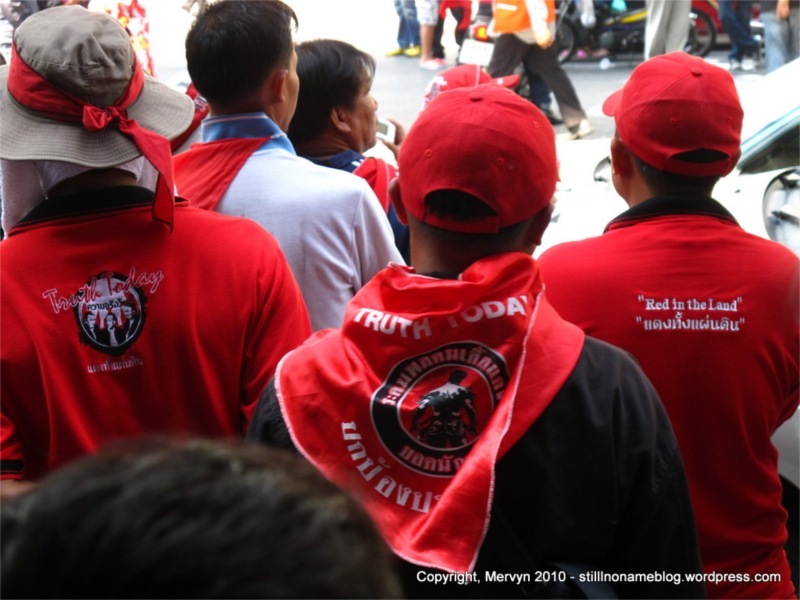 Turns out these are the security forces or guards of the Red Shirt movement. I know this because a few of them had “Guard” written on the backs of their shirts. They seemed to command a lot of respect. People followed their orders. A person dressed like a policeman joined the black Reds. I say “dressed like” because he wasn’t doing what I’d expect a policeman to do in that situation, namely at least be a little upset that a bunch of people had overrun his position. There was even a guy in full army fatigues with a red sash around his neck. A black masked ninja, a policeman, a solider; it was like a gathering of the brown, militant wing of the Village People. Other than the one, cooperative police-looking fellow on the radio, all the other cops were nowhere to be seen. All that remained were the yellow metal barriers pushed aside and two large S.W.A.T.-looking vehicles parked unattended on the side of the soi. I was standing in a crowd of Red Shirts watching the scene play out. Vehicles would approach the intersection. The men in black would wave some vehicles through. If, however, the vehicles were large, loud, and filled to the brim with Reds, the men in black would send them down the soi. 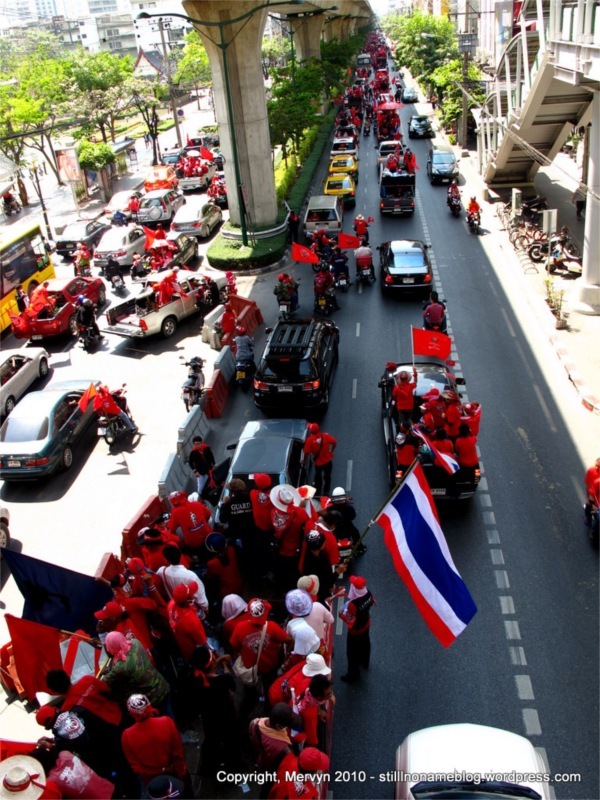 Every time a particularly boisterous or rowdy truck of protesters went down the soi, the few hundred Reds gathered around the intersection would cheer and clap. 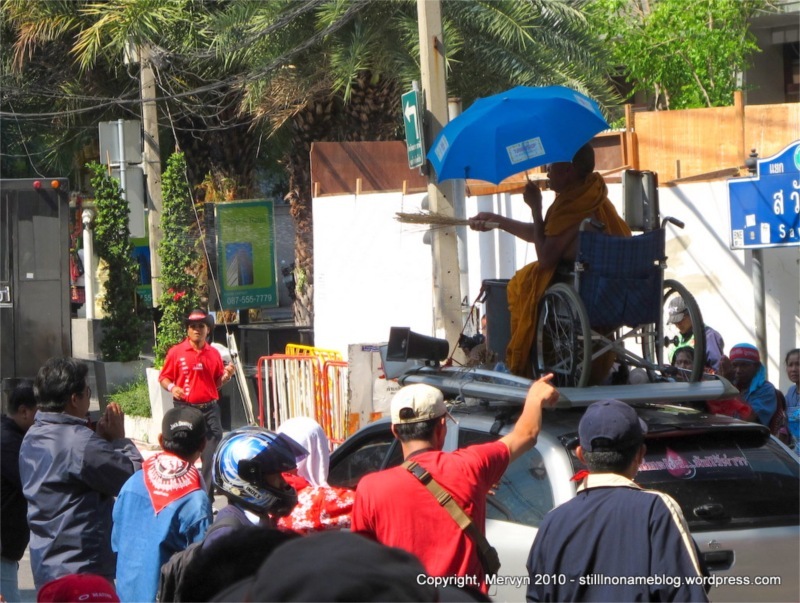 The vehicle that got the loudest reaction, however, only contained one man: a monk in a wheel chair mounted to the roof of a silver Nissan. He held a bundle of sticks which he waved at the crowd like a beauty queen’s scepter. The people ate it up and were even more delighted when, in the spirit of the Songkran water festival, he dipped the sticks into a pail of water and used it to fling water at the crowds. It’s no surprise that he got waved into the soi. The whole thing didn’t feel dangerous. In some ways, it felt like a parade. It looked to me, though, that the Reds controlled the streets. They’d expanded beyond their demonstration stages with the lights, cameras, sound systems, and big screens. They were coming and going as they pleased. They were directing traffic and screening cars. In fact, they may have had the cooperation of some of the police. It’s hard to tell, though. Were the policemen cooperating or were they just doing what it took to stay alive in the face of thousands of protesters? Despite the Reds in the street, things did seem more normal. The Skytrain was open at all stations. All the shopping centers were open except for those directly on the Ratchaprasong intersection (mainly, high-end Gaysorn). I spent the whole day looking for a decent way to get to Siem Riep and the temples of Angkor Wat all the while hopping from food court to food court gorging myself. To me, that’s perfectly normal. I didn’t hear anyone fire real or rubber bullets. I never got my eyes stung from tear gas. I didn’t see people stripping army vehicles clean. I saw no blood other than the fake stuff on the “The PM is Hitler” poster. The greatest threat to my health was that all the good food I’d eaten might someday make me a heart attack prone fatty. On the news front, it looks like an election commission has determined that the ruling party has taken unlawful campaign contributions and that they should suffer essentially the same fate as Thaksin’s party; the party must be dissolved and its members may not participate in politics for 5 years. It’s quite a victory for the Red Shirts because the determination calls into question the legitimacy of the current government. 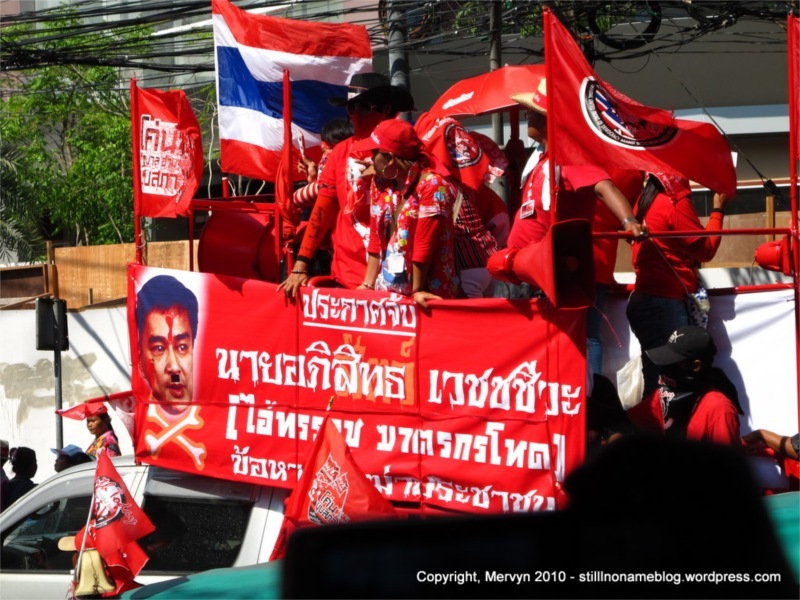 A court still has to review the election commission’s determination, but the Red Shirts must feel like they gave their opponents a good stab to the lung; the current government may not be dead, but it’s breathing heavy and its health is in serious question. What I want to know is where the army is going to come out on this. They’re the major swing vote in this political environment. In this topsy-turvy democracy, they’re the vote that has the gun. The next few days should be interesting. Snack Food Break: I went down to the nearest 7-11 to get a writing snack. I grabbed a cup of yogurt, the healthiest writing chow I’ve had in weeks, and noticed something interesting: yogurt flavored soda. 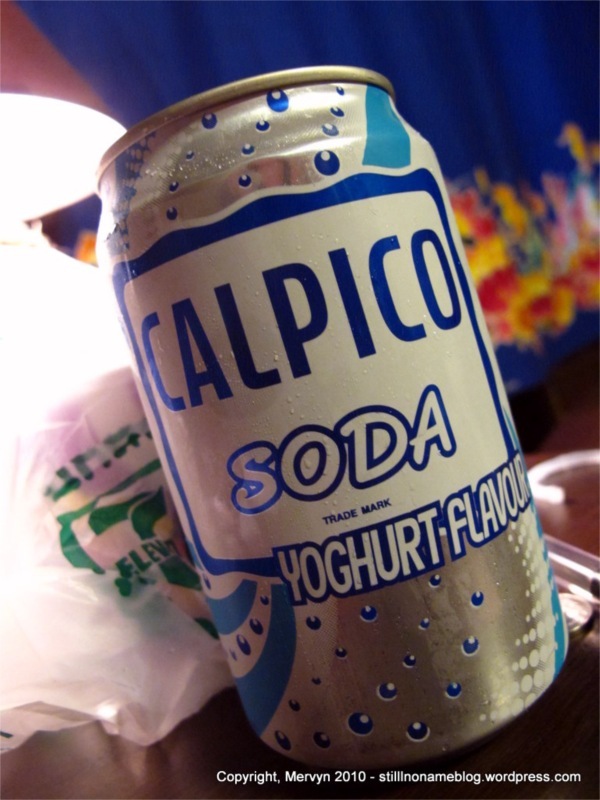 Or, to be absolutely precise: “Calpico Soda – Yoghurt Flavour.” I had to try it. I braced my palate as I dipped my straw into the drink (in Thailand only savage farang drink straight out of a bottle or can). I prepared for a taste of sour, clotty yogurt mixed with feet. It actually was quite good. Like cream soda, but with about three pounds less sugar. It also had a nice touch of sour in the finish. Quite refreshing in fact. If I see it again, I’ll buy another one and be glad I cannot read the calorie content because the whole thing (other than one of the two labels) is in Thai. Besides, I’m on vacation, so junk foods are like prostitutes; they don’t count. lol. You are coming back either fatter or with an STD. There are protective measures for both. Use accordingly. If I am lucky, perhaps one will counteract the other. There are venerials that make you lose weight, right? Right? Anyone?